There was a point in the race at about mile 24 where the crowds thinned and we were running by a small pocket park that fronted the Merrimack River. Gravel paths weaved around low shrubbery and birch trees, all of it offering a nice view of the riverside foliage and the city of Lowell beyond it. It seemed like a nice place to spend some time. You know what else it had? Benches. Smooth slats of wood, warmed by the sun that promised solid support for some very tired legs. It was a tantalizing siren. The skinny guy in the blue singlet, that I had been following for over twenty miles, veered right, sat on the first bench he passed and closed his eyes. He didn’t look like he was moving anytime soon. I didn’t blame him one bit. Being a first time marathoner, if there was one thing I was naive about it was those last three miles. Holy hell. Nothing in training can really replicate the fatigue, both physical and mental, of those final miles. If it did, I’m not sure how many people would keep signing up. I stocked up on sleep in the days leading up to Sunday, but actually didn’t find it too hard to sleep the night before. My only regret was that I missed the Red Sox clinching win, but I’m sure, even with the sleep stockpile, I would have been regretting staying up when that alarm hit at 4:30 a.m. I had packed my gear bag the night before so the morning was more about making sure I stuck to my routines and took in the proper nutrition: 1 cup of coffee, rice cereal with honey and almond butter and then water. I brought my pre-workout drink in the car. I did not repeat the mistake of the last month’s harried half marathon start. We arrived at the race well before the sun and had plenty of time to get oriented. We actually might have been a bit too early. Parking in one of the garages suggested in the race information, but not the one directly opposite the course, we were left on the empty, downtown streets with little direction of where to go. We weren’t the only ones either. Small packs of other people in spandex and running shoes were also wandering the pre-dawn streets. Eventually, with some trial and error, we worked our way over to the race start, but a few prominent signs would have been helpful. Thankfully, they opened the first floor of the high school as a staging area because it was still quite chilly. I wish they had opened the locker rooms too, as the bathroom lines,even this early, quickly grew lengthy. The bag check was quick and easy. Maybe too easy as my tag ended up getting ripped off causing some confusion in retrieving my bag later at the finish area. While the start and finish were in the approximate same area, it wasn’t exactly the same, so volunteers were taking bags and tossing them into a U-haul before driving them over to the finish. After the bathroom line and bag check, the sun had come up and I ran through my warm-up. Plenty of space (but little grass if you wanted to lie down to stretch) to warm up and jog around the starting line. Soon enough it was time to line up and go. The race was self-seeding, no corrals, but there was plenty of space and little jostling or pushing for position. One oddity to note that I’ve never experienced before in a race occurred right at the start. It was noted that the roads were not closed, but I did not expect a police van with siren blaring to come driving straight into the crowd about 400 yards into the race when both the full and half marathon were together and blanketing both sides of the road. I hope it was important. 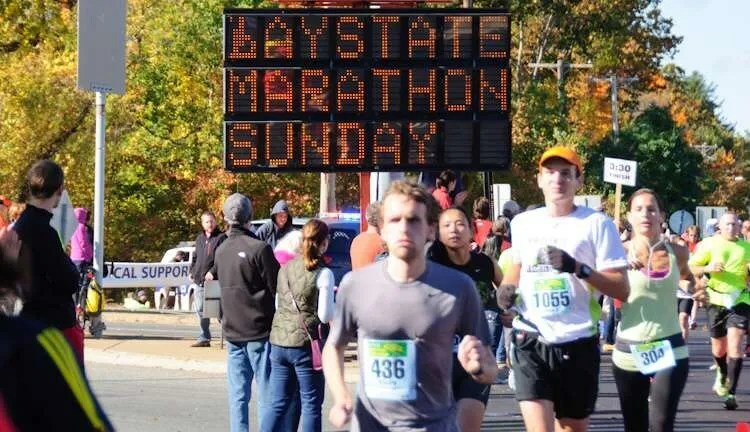 The marathon was essentially two big loops with little spurs at the start and end to get you back to the Tsongas arena area where the race started and ended. It was just as flat (and for some, not me, as fast) as advertised. If I had any complaints about the race, it would be on the outward half of the loop. It was very congested (with the roads open they coned off the shoulder and a little extra for us). They also rather inexplicably placed these low directional signs for the marathon/half marathon split right in the middle of the course causing many folks to hurdle, swerve or crash into them. Finally, the road itself in this area was very chewed up (pot holes, cracks, uneven pavement) which caused a couple close calls on turned ankles. It all didn’t make for easy running. Once the field thinned, it was less problematic on the second loop, but still less than ideal. Fortunately, things improved on the back half. The commercial district, scrub grass and railroad tracks fell away and we had mostly new pavement and foliage-laced river views to carry us along until we hit the mass of spectators at the next bridge and the turn for the start of the next loop. I had an average day overall. I never really felt terrible (last couple miles excluded) but never really felt great either. On a few of my long runs I’ve found that sweet zone where clicking over a 7:40 mile after mile just feels so easy. Never felt that on Sunday. I had hoped to keep things in cruise control, slowly lowering the pace, until mile 20 before I really started to dig in and concentrate, but I felt myself laboring probably by mile 15 and was never really able to put in a kick at the end. I didn’t totally falter either. 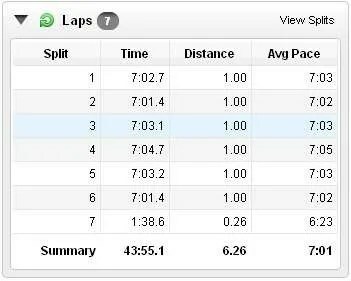 Using the 3:30 pace group as a guide, I kept pretty even splits throughout the race. On the nutrition side, I think I could have done better. I used two gels, ate one date and one Clif block, about half the food I was carrying. The aid stations were perfectly spaced about every mile and half to two miles and had water and Gatorade at every stop. I think I only skipped one and usually took Gatorade over the water. I think those extra calories gave me just enough to finish. The one fail moment during the race was my salt/electrolyte pills getting stuck in the container. I was able to get two out, but two remained jammed no matter what I tried. I missed that extra salt in those last miles. One other thing that really messed with my mind, even though I knew it would happen, was the ‘extra’ running you do during the marathon. A certified course is measured so that the absolute minimum you can run is the race distance. Most entrants will run more, sometimes significantly more. I tried to be careful and keep to the side, but I still ended up running 26.4 and trust me when my watch hit 26.2, my body really, really, really wanted to be done. The Results – Local Class all the way! As I mentioned above, it was a solid day. I executed most of my plan and though I couldn’t finish quite as strong as I would have liked, my steady splits over that distance, especially for a debut, were a sort of achievement in and of itself. Or so I tell myself. My fastest mile was 7:41 (mile 24 at that!) and my slowest was 8:03 (my only mile over 8 minutes and I blame my fussing with getting my dates unwrapped from the pesky Saran wrap). You can see me start to push (as much as I was able) and drop the pace to the low 7:40s at mile 23 and I wish I could have held that through the end but mile 26 included a diabolical section of banked, curved road that had my feet screaming and sapped whatever little energy I had saved for the end. I did run a slightly positive split by 1:40 but can’t work up the energy to chastise myself too much for that. You’ll also notice this race gives you an ‘age grade’, something I haven’t seen before, but is apparently more common in Europe. It’s supposed to normalize the results across age and gender to better allow runners to compare against each other (like people that run these things really need another competitive stat!). I received a 60.98%. The 60-70% range rates as ‘Local Class.’ I’ll take it! Call me superficial, but if the race itself is well run and organized (and even for charity) but they stiff you on the post-race refreshments, it’s a negative in my book. This race did not skimp. Rarely has something tasted so good as the salted vegetable soup I had at the finish line. They were also fully stocked with bananas, water, protein bars, PB&Js, soup and soda. There might have been more, but at that point I really just wanted to find a bench. A special thanks to my support crew: Chelle, Cecilia and Dad. I really needed those high-fives at mile 23 and I really, really needed the support back to the car! This race is advertised as for runners, by runners and it’s an apt description. There’s very little fluff that you might find with more for-profit races (the expo was practically non-existent), but what’s left is really what matters. The only complaint I have is what I mentioned above about the roads, congestion and rather hum-drum scenery of the first part of the race. If you are looking to post a PR or pick up a BQ, then this is probably your best opportunity in New England. Its very flat with only a few gentle rollers. The pace groups are great and it attracts a fast field if you are looking to follow some feet. I do not taper well. After almost 10 years of marriage, we have a lot of unwritten rules that keep the household ship off the shoals. One rule, high on the list, is that I need to exercise almost daily. If I don’t, I get restless, irritable, and cranky. I’m a 70 year old man that was charged a nickel too much for his coffee. I’m a 10 month old that can’t dropped her bottle. Suddenly there are three little kids to deal with in the house. It can make tapering for big races a challenging and fraught time. The fact that I at least recognize this psychosis is a step in the right direction and I’m trying hard this year not to let it throw me off stride (ahem). Having two little kid and a nutty puppy certainly gives me plenty of distractions to keep my occupied, but I was relieved when I woke up this morning and started to feel excited for the race this morning. It was like emerging from a fog. In retrospect it was probably more than just the taper this time. After three 40 and 50 mile weeks in a row, I hit the 2 week slow down and taper sore and very relieved. And very burned out. If (okay, let’s not kid ourselves, when) I do this again, I think I’ll cut the training time back from 20 weeks to 16 weeks. The problem was that as the recovery week moved into the taper week, I still just felt mostly relief at not having to put the running shoes on every day and little to no excitement for the upcoming marathon. It was a weird blue period, that thankfully seems to be lifting. The other thing I’m trying to do this year is shift my focus during the taper off the drastic reduction in activity and toward a better mental race prep. Over 26 miles, a strong mental game is likely to be just as important as strong legs. As a writer, I’m very familiar with self-doubt and I’m hoping this kinship will pay off. There is a point in writing any story, short or novel length, where you become absolute sure that what you are writing is all worthless drivel and a complete waste of time. At this point I almost welcome the feeling. Personally, I know it means I’m almost done and if I push through, the feeling will (mostly) pass. From all that I’ve read and watched, I think I can expect something similar in the marathon, probably around mile 18 – 20. During a couple long runs, I definitely hit a point where my legs were concrete pillars, my lungs were suddenly heaving and taking another step felt like running in cement. I’d like to avoid that on Sunday, but if not, I want to be mentally ready to beat back those feelings rather than indulge them. I’ve also come to terms with the fact that there is no perfect race. Despite all the long runs, short runs, intervals, strides and stretching, you can’t prepare for it all. A marathon is a long race and I’ve spent much of this week going through various scenarios in my mind and having a plan or a response for each high or low I hit. Being on a primarily plant based diet, this is actually proving to be one of the harder pieces of race week. You’d think I might enjoy the respite from greens and whole foods, but, starting yesterday, trying to cram in all these carbs (oatmeal with brown sugar and honey, white bread, Gatorade, bagels, white rice, gummy candy) has led to some rather wild swings in energy. And you know what, I still don’t think I’m hitting the ideal number my coach is recommending. Based on my weight, I should be consuming over 500 grams of carbs each day leading up to the race. If you’re not recoiling, you should be. That is a massive number. But I’ve stuck with his plan so far, so to question it now would be a little self-defeating. Gotta embrace it. Excuse me, I’ve got to eat another bagel. The race is the Bay State Marathon in Lowell, MA, about an hour north/northwest of Boston. The course runs through downtown Lowell and a neighboring town and mostly hugs the Merrimack River. I’ve scouted the course (thank you Google street view) and made sure I’ve read through the athlete guide so I don’t have any surprises race morning. Anything to reduce the race day stress. This race is a big BQ qualifier (no, I’m not attempting to qualify, it’s flattering you ask) and is flat (really flat) and, hopefully for me, fast. The total gain is less than 200 feet over the duration of the race. No complaints there. The one thing I am definitely changing from a few weeks ago, is to be almost obnoxiously early. I definitely felt a little sluggish in the half-marathon by skipping the pre-race warm-up routines that I’ve been doing during this whole training set. I do not want to miss those on Sunday. Given how well the half-marathon rehearsal went, I’m going to largely stick with the same plan for race morning nutrition. One cup of coffee, white rice cereal with honey and almond butter then water on the drive to the race before sipping on a pre-run energy drink and maybe some Amrita bar depending on how I’m feeling. It worked for the half and worked during my weekly long runs. I’m not deviating now. During the run, I plan to carry some dates, four gels and a pack of lemon-lime Clif shots in my race belt. I’m going to try to get 100 calories an hour. The race has aid stations every 1.5 miles or so with water and Gatorade and I can supplement my own gels with race gels at mile 7 or 17. After practically bathing in Purell and being terrified of falling off a curb and twisting my ankle, I’ve managed to get through the last two weeks injury free. I’m still nursing a mild case of plantar fasciitis (self-diagnosed), but it actually bothers me more when I’m walking and going about my day than when I’m running. I hope that remains the case on Sunday. It will definitely be something I’m going to have rehab in the off-season, but there’s nothing I can do other than continue to ice, stretch and roll it until the race. Overall, I fell about as healthy as I could be after 20 weeks of hard training. I know I need to go out very conservatively. For the first five miles I want to put a floor on my pace of no faster than 8:00. I know from a couple tough long runs that burning those matches with a 7:40 mile early will just kill you on the back half. The plan would then be to slowly (are you listening Mike, slowly!) ease into the race pace with the next ten miles between 7:50 and 7:55 and try to hold onto that good, I-can-keep-this-up-forever feeling for as long as possible. If I can hit 20 miles still hitting 7:50s, I plan to loosen up and just run the last six as fast I as I possible can. In short, do the first third with my watch, the second third by feel and the last third with heart. Finally, the weather, something completely out of my control, but something I’ve been compulsively checking six times a day anyway. Right now, it looks good, high of 59 and partly cloudy. Perfect marathon weather. Other than the first race of the season being snowed out, my horrible weather streak in 2012 has mostly flipped and produced some really great days in this year. I’m sure this dooms next month’s marathon, but for this half marathon, the weather was cool, dry, bright and sunny. Woke up on time (always a source of stress and wildly imaginative scenarios where I miss the race) and had my coffee (gotta get things moving) with my Chrissie Wellington breakfast: a bowl of rice cereal with a little salt, a dollop of honey and a spoonful of almond butter. I mixed up some Vega pre-workout energizer to sip in the car then double-checked my (now clear for security) race bag: nutrition (2 dates, a gel and some lemon-lime Clif blocks), watch and some extra clothes and I was ready to go. After a wrong turn (very unlike me, I was carpooling with a friend that was racing and just to chatting, also sort of unlike me), we made it to race site and were greeted by a long line of taillights. I have to say it was sort of unexpected. The race was being held outside a horce racing track, so there was ample, ample parking, but due to restrictions or poor traffic logistics things backed up pretty severely. By the time we parked, there was less than a half hour until the race start time (and still many, many cars in line). One thing we did not have to stress about was rest rooms. Usually a good chunk of pre-race planning is timing your last port-a-potty trip. Thankfully, between the race track facilities and ample portable stalls, there were very short lines all around. Yay! If the race directors stepped up with the toilets, they fell down with the bag check. With less than ten minutes until the race the line was still probably a hundred deep waiting for the two or three volunteers (I couldn’t even see that far) to rack everyone’s bag. This should be the last thing a runner needs to stress about. Boo! I ended up jogging back to my car and hurriedly running back to the start. Despite all the lines and parking woes, the race started on time. I do appreciate a prompt race director. There is nothing worse than being all warmed up and stuck in the corrals. The first three to four miles wind through the working class East Boston neighborhood that surrounds the race track and for the early hour there were quite a few people hanging out by their front doors cheering us on. My only complaint was the pavement in parts wasn’t great and you really had to watch your step. I managed to avoid rabbiting out too fast, in my mile splits you can see where I start to throttle back to keep things in check. I settled in and let the pack mostly flow around me until I found a group going my speed. The middle of the course is run right along the ocean by Revere Beach. New pavement, closed roads, the ocean on one side, interesting beach shops and restaurants on the other made this a really nice part of the run. There were a few live bands along the route, as well as some DJs in case the scenery wasn’t enough. Once we reached the first turnaround and the halfway mark, I was still feeling good and I started to let my speed naturally creep up. There were aid stations about every two miles and I was taking liquids at each one, even just a mouthful, alternating between Gatorade and water. At the second turnaround as we started to leave the beach and loop back through the neighborhoods toward the track, I let go of the watch and just ran as hard as I could. Unlike past races were I faded quite badly or had my IBTs tighten up to the point were I was almost limping home, I finished strong, really strong, passing a lot of people, beating my prediction and grabbing a new PR. New PR by over 3 mins! In retrospect, maybe I was a little too conservative in the first part of the race. 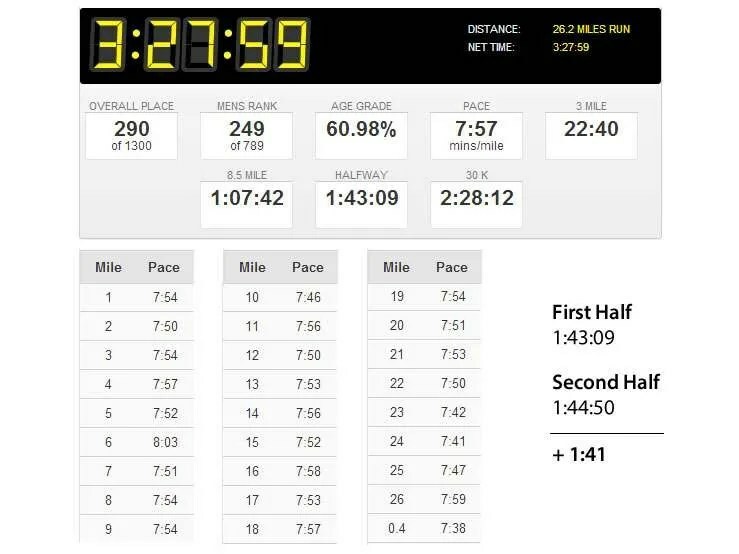 Next time, I think I might try to lower my overall average mile time a bit and smooth out the overall splits. Still, it’s hard to complain about setting a PR. I ran the race I planned: rehearse for the marathon, stay on pace early, finish strong. The second half of my run was 2:33 faster than the first half and each 5k reflected the plan to pace than build to a finish (23:33, 23:49 (checking my pace on purpose), 23:06, 21:38). Hard to really complain too much. Stick to the plan = happy race! And negative splits. They had the medals being handed out, finisher photos and water in the chute. The rest of the snacks and drinks were inside the track. The spread was a little thin for such a large event. Bananas, oranges, strawberries(? ), more water, and Oreos. There was also a large beer garden and live band (maybe this is where the money went), however the beer garden didn’t open until 10:30 while most of the 13.1 racers (the 5k was done) were finishing between 9 and 9:30. A long time to hang around. I saw a lot of people trying to give away beer tickets. This weekend’s race is serving two purposes: first, it’s a dress rehearsal for next month’s Bay State Marathon, my ‘A’ race this season. Second, it’s breaking up the 20 week training plan I’ve been on for the marathon. (If I use this plan again, I’d cut it down to 16 weeks. ) Racing is fun and a good litmus test to see if all the miles, tempos and intervals are paying off. The race is actually at Suffolk Downs a horse race track in East Boston, not the city proper. The half marathon course is an out and back course that hugs the coast up toward the north shore. Should be nice views, but could be cold and windy off the water if the weather is bad. Right now it looks good (after a surprise burst of heat this week). As a dress rehearsal for the marathon, I want to test out my pre-race routine (this race starts at 7:30, the marathon at 8), and nutrition. 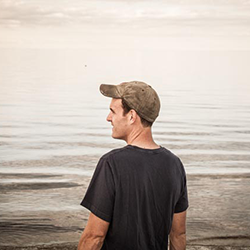 During the race, I want to focus on early pacing. I need to keep the pace under control. My two previous halves, I’ve been too aggressive early and really paid for it in the last third. I know I will pay double if I burn too many matches early in a marathon. I want to finish strong. After the halfway mark, if I feel good, I’ll let go and run by feel. If not, I’ll keep pacing and treat the day as a catered training day. I also want to test out clothes and shoes. After running the past two years in more minimal shoes, I found my feet aching after long runs and recently switched to a, still neutral, but more padded shoes (New Balance 750v2). We are still getting used to each other. A little worried about a persistent hotspot on my right foot. Finally, I want to practice my nutrition. I’ve been pretty consistent during my long runs with the gels, food, salt pills and blocks, and have not had any issues, but want to put them through a race environment. Along with the fuel and race belts. 1:37:22 – I actually set a half marathon PR last week during a 16 mile long run, lowering it almost two minutes, from 1:40:52 to 1:38:46, so I know the training is paying off. If I can find that flow again, I think I can drop it even further. 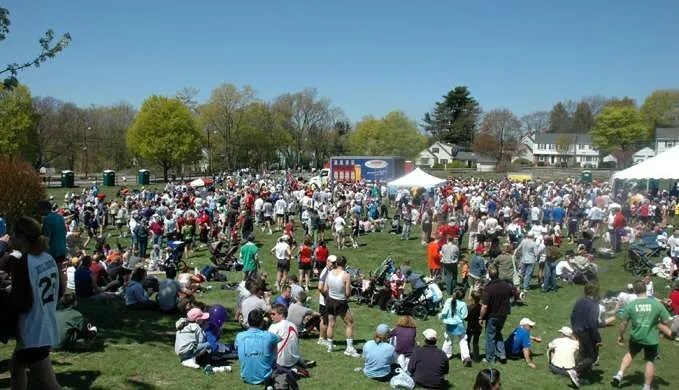 The James Joyce Ramble is a 10k (about 6.25 miles for you non-metric fans) road race held in Dedham, Massachusetts, a town roughly fifteen miles south of Boston. 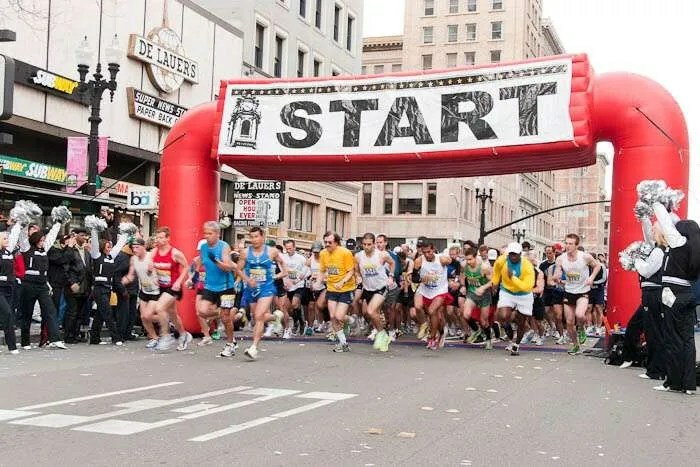 It’s a race with some history (this year was the 30th running) that attracts a wide and diverse field that typically numbers around two thousand. This is the fourth or fifth time I’ve ran it. 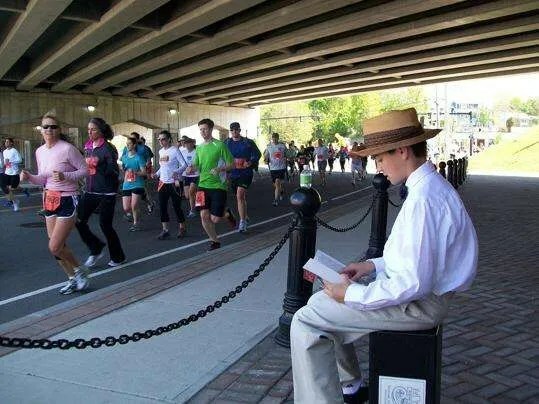 The unique aspect of this race is that the course is lined with costumed performers reading from Joyce. Really. It adds a little bit of a surreal atmosphere. It’s also the only race I know of that starts with a gong. The race itself starts at the Endicott estate, which is a large, mostly open area surrounding an estate house on a residential street. It’s actually a great space for post-race festivities, but can get a bit cramped and bottle-necked if you are one of the two thousand registering on race day pickup or trying to find a parking spot. There are options to pick up the Friday and Saturday before (the race is on Sunday), both on-site and off. If you can swing it, I’d recommend that approach rather than on race day. You don’t want to wait in line for your bib/chip then go right back into a line for the port-o-pots (there’s always lines). I opted to register (avoiding the ‘convenience’ charge of registering online) in person and pick up on the Friday prior to the race at an off-site shopping mall. This had worked well for me in past years, but this time it sort of backfired. This year the race was also serving as the US 10K Masters Championship and it must have swelled the field and resources a bit. By the time I made it over to register after work, they had run out of timing chips. I was able to register, but had to swap my temporary bib for a chipped bib on race day sort of defeating the whole point of pre-race registering and avoiding any leg draining race day lines. The leisurely 11 a.m. start makes fueling on race day less of a challenge than the early morning races. I ate a typical breakfast. A bowl of cereal with coconut milk and an English muffin with almond butter at 7 along with a cup of coffee. Driving to the race I had a banana and sipped some water. Ten minutes before the start I ate 2 dates. That was it. You don’t need to stress too much on a 10k with nutrition just make sure the tanks are topped off. My typically strategy is not to get cute and just do what has worked in the past on regular weekend training days. As mentioned above, the residential area start can make parking a challenge. This year, it appeared some of the surrounding business on the closest commercial strip were also patrolling their lots to keep runners from parking there. If you can get there early, there are limited on-site spots otherwise be prepared to hunt down one of the limited spots nearby and walk a bit, just the thing you want to do before a 10k! Luckily, the bib swap ended up being a non-factor as they had plenty of volunteers to register and help runners. Despite numerous port-of-potties, that were strategically laid out around the edge of the estate, lines were still long, but not unbearable. I’ve seen much, much worse. Weather this year was warm for the end of April in the Northeast with temps around 70, bright sun and some humidity. Not awful, sounds nice actually, but not ideal for most folks coming off four months of snow and ice. Two weeks after the marathon bombing there was also a noticeably increased police and security presence. This is not an easy course. Just looking at the elevation map might not make it look like much, but don’t be fooled. While most of the first half is downhill, the second half is decidedly uphill with two steep rollers back-to-back right past the halfway mark that really take a bite out of your legs. If that wasn’t punishment enough the final half mile to the finish is a lung-crushing, gradual climb, as well. The other thing worth mentioning is that the residential street start makes for a cramped and slow start. If you plan on trying to run fast it’s worth moving over to the start line early and staking out a spot near the front and left side of the street. Knowing that those twin hills were looming, my plan was to go out conservatively, let the tight pack at the start pace me a bit, attack those hills and hang on for that uphill finish. In terms of nutrition, I had one more date that I carried in case I needed a boost of sugar (didn’t need it) and with water stops almost every mile, I took it as needed (I think I hit three of the stops). My plan to go out easy and reverse split the last half of the race didn’t really materialize, but not in a totally bad way. My mile splits were remarkably even for a shorter, hilly race. I’ve seen some big swings in past splits. I think the weather also had an effect. One downside to the late morning start was the noon day sun. Most of the race offers little sustained shade and it takes a toll running on the hot asphalt especially early in the year. So overall, while I didn’t quite execute my plan (or hit a PR for this race), I was happy with my results given the course and the conditions. One place this race really shines is the after party. The large green space finally pays dividends as runners and spectators are able to spread out, enjoy live music, free (good) beer (Harpoon), quality snacks (from Whole Foods) and a pasta buffet. It’s a nice family friend atmosphere that invites you to linger and hang out with fellow runners. This is a race I plan to continue running for many years in the future. It’s a well-organized race with a challenging course, early in the season that really gut checks where you are in your training. To top it off, the post-race food, beer garden and family friendly atmosphere makes it a good race to bring the whole family. Definitely recommended to any Northeast runner. I’m looking out my window and fresh snow is falling on the existing three feet high snowbanks along the driveway and I’m questioning the sanity of starting my season in February while living in the Northeast. In past years, I’ve eased into the season with 5Ks in March, typically around St. Patty’s Day, and typically with a race that featured a pint at the end. This year, perhaps to keep me motivated to up the annual mileage or just to avoid using my paternity leave as a crutch to slack off, I chose the Old Fashioned Ten Miler in Foxboro tomorrow as my first race of the 2013 season. One part of me (the type A part) is looking at it as a challenge. Snow, wind, black ice, sub-zero temps? Bring it on. The other part of me is itching to scrap it and log a few miles on the treadmill in the basement next to the percolating warmth of the boiler room. First, a quick look back. The further I get away from 2012, the more mellow I become about the results. After the last 5k in December, I felt pretty down on the season despite setting two PRs and finishing another half marathon. My big goal for the first part of 2012 was strength and speed work with the benchmark being breaking 20:00 for a 5k. Believe it or not, of the 6 5k’s I ran in 2012, I ran each between 20:00 and 20:12. If you’re feeling generous, you might give me that one. I hit 20:00 on the nose, but never dipped under it. A new PR, but not a gold star for my goal. The second PR was in the Finish at the 50 10k at Gillette stadium on a pretty hot July 3rd. I finished 16th in my age group and posted a 42:39. Not too shabby, but I put a mental asterisk next to this one as the first kilometer or so is on a serious downhill, so a steep hill-aided PR. The big goal for the second half of ’12 was completing my second half marathon and improving on my first time at Rock N Roll Providence (1:40:52). I did finish the race (the flat Smuttynose Rockfest in Hampton), but failed to top my Providence time as both IT bands tightened painfully around mile 10 (up to that point, I was very pleased with my nutrition and pacing) and the last three miles were finished at a hobbling limp. Net result? Two minutes slower than Providence (1:42:50). Errr. Time to put the 2013 goals in writing to ensure a little accountability. The big goal for ’13 is my first triathlon. I chose a sprint one, USAT certified, but with a capped field that I hope will provide both a gentle introduction to the sport and a fun experience. This is local and in mid-July. Ramping up cycling and re-learning to swim should be interesting learning experiences. Haven’t completely made up my mind about this one. Given that we have a new baby and being cognizant of how much time it would take to train the way I’d like for a full marathon, it makes me leery of stepping up to the full this year. If I chose a full, I’d aim for one in mid-October. Maybe the Bay State. If I go multiple halves, the Ocean State Triple Crown series looks fun. I am not flexible. Never have been, but as I work to take on more endurance races and get older, I’m increasingly aware of how better flexibility can aid training, recovering and prevent nagging injuries (see the IT band issues above). Last year, I did yoga fairly regularly, I’d like to continue that and be better about consistent foam rolling on a weekly basis. I plan to write about this more soon, but since December I’ve been eating a largely plant-based diet and really feeling the benefits in all aspects of my life: sleep, work, energy for playing with the kids, training. The plan is to keep this up for the rest of 2013. That seems like a solid, challenging, yet achievable list. Here are the events I’m eying for early in 2013. So after a so-so 2012, I’m ready to push harder into 2013. It all starts tomorrow in the snow, sleet and wind.